It was normally comes in a pot shape that I have to dig your fingers/spatula into it to apply on your face. That way I always got the mask into my finger nails and I hated it. Some of them dries up in the pot very easily after they were contacted with air and I can't even use half of the products anymore after a while! Most of it are hard to be washed off! But I've found these clay masks that has different functions in different colours, and most importantly it comes in a tube shape! Which means I don't need to dig my fingers into the pot anymore and the remaining products doesn't contact with air that makes it dries up! Hygienic and convenient! 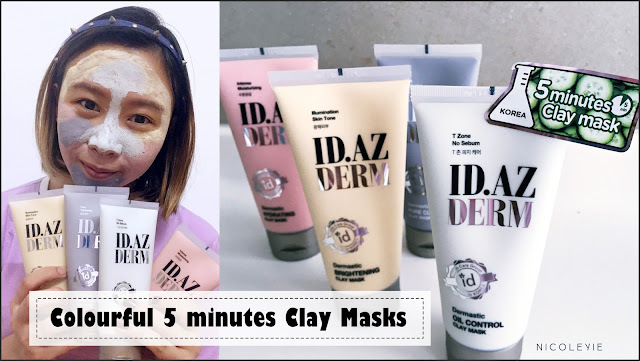 So these pretty colourful mask are from a Korean brand called ID.AZ. Why is the name looks so different? "ID" comes from the product origin - ID Hospital. It's a Global Cosmetic & Plastic Surgery Center in Korea, which also known as ‘Asian Beauty Center’. "AZ" stands for A to Z, which means encompaasing everything from A, the first letter in alphabet, to the last letter Z. And this is how the company gave the name for their new skincare line! Pretty creative I shall say. Look how pretty the colours are after putting them all together! It's a Dermatology brand, you can say that their products are pretty safe to use and suitable for sensitive skin too. It comes in a tube bottle and has 4 different colours to target different skin condition on your skin! The texture of the clay mask. It actually dries up faster than a lot of clay masks that I used before, which is a good thing cause I don't like to wait for it to dry for too long. Now let me show you how I use these different colours to apply on different parts of my skin. If you are too lazy to continue reading, feel free to watch how I use it in my IGTV here. The first series of skin products are always the Pore Cleaning one cause you know my skin condition is always so bad, and I want a clean and clear skin please! So now I'm going to use the Pore Clean Clay Mask first. 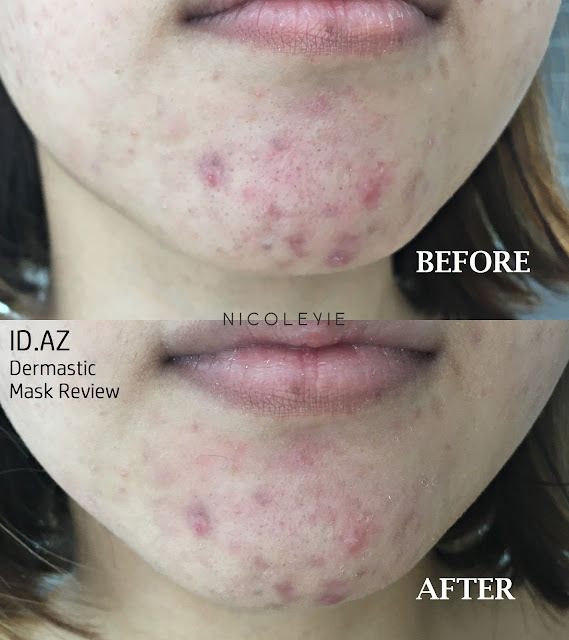 The Dermastic Pore Clean Clay Mask contains Hawaiian Clay that soothes skin trouble and keeps skin fresh and smooth. It provides soothing effects for sensitive skin while cleansing, tightening pores and exfoliating skin. Key Ingredients: Hawaiian Sea Silt Fermented Clay+AHA/BHA+Charcoal. 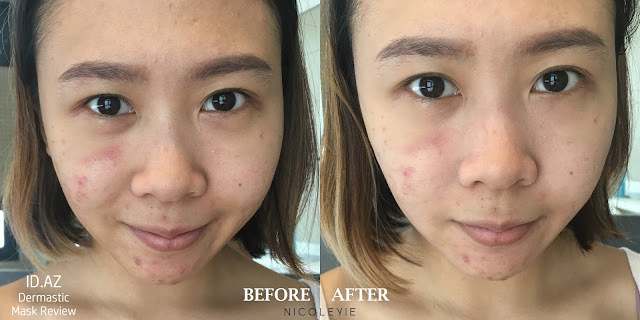 For my current skin condition, the area that needs the most pore cleansing is my chin and cheeks as I'm having breakouts around these areas. Bottom: The clay mask dries up after 5 minutes. You can just apply a thin layer for it to dry quicker on a rushing day, but still get the pores cleaned. Did you noticed the blackhead was reduced?! I was shocked to see this after putting these 2 images together! Sometimes I just simply apply the pore clean claymask all over the face just to cleanse my dirty pores away. My next skin concern is my super oily skin, especially at my T-zone and forehead! So I will be using the Oil Control Clay Mask next. Canadian Glacier Clay is what contains in the Dermastic Oil Control Clay Mask that helps to calm skin anxieties and removes excess oil. It's concept is to balances skin oil for a fresh and healthy-looking complexion, especially for the T-zone. I'm having a combination skin and my T-zone area tends to have the most oil. Put a thicker layer on the middle of my nose as it's the oiliest part of my skin. This is the close up look on the clay mask after dries up. swear I did not meituxiuxiu my 2nd pic! It's non-edited and I was surprised once again! 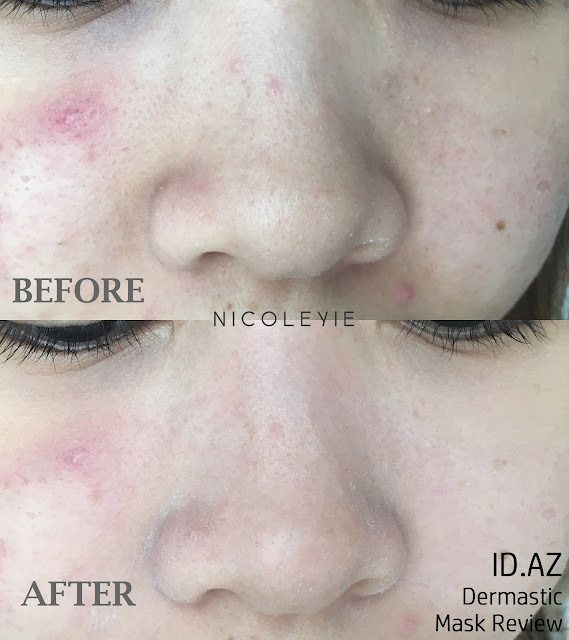 My pores size has reduced so much that my skin looks so smooth now! Next up I give some other parts of the skin some moisture with the Hydrating Clay Mask. and keep your skin moisturized and energized. I applied the hydrating mask on the remaining area since most part of my skin needs more of pore cleaning and oil controlling. Close up look on the clay mask after a few minutes. 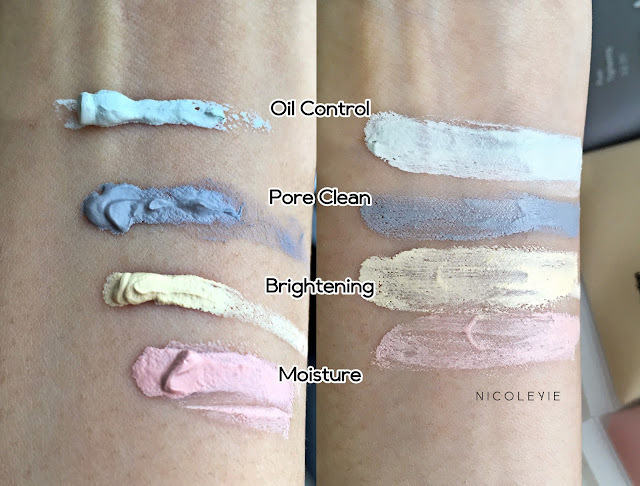 I even did a moisture test on the Hydrating Clay Mask & Oil Control Clay Mask because I doubted that the clay masks can provide moisture as they tend to stripe your skin moisture away more than any mask, especially if you leave it on for too long! 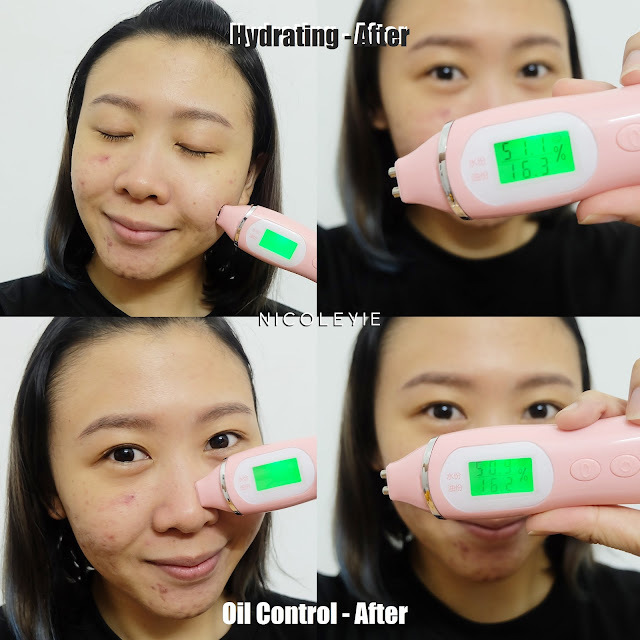 As you can tell my device showed that my skin is so dehydrated and oily even after I cleansed my skin. Focusing the oily part on my T-zone and others to be hydrated. Okay I really wasn't expecting the positive result (nor my device work cause I didn't really use it for very long time). 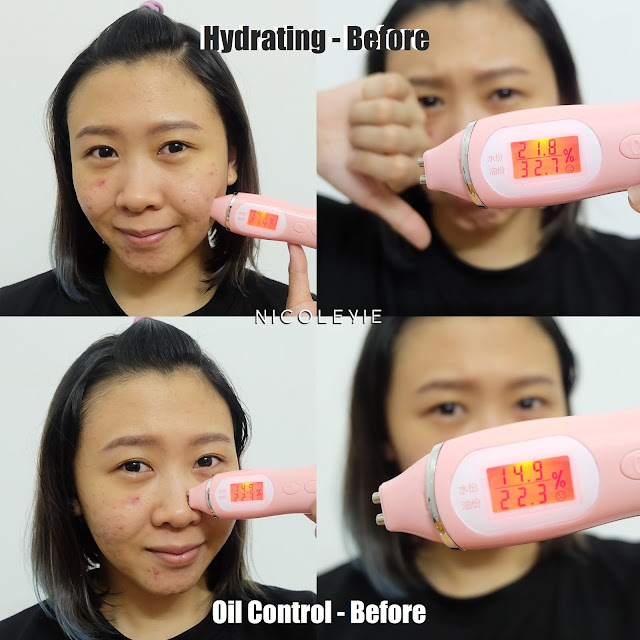 I did feel my skin smoother after hydrating my skin, which means it does hydrates your skin! Lastly, the Brightening Clay Mask, which I didn't use it very much cause I need to focus on cleansing and treating my skin first, but here's a small description about this product. Revitalize your skin with the Amazonian White Clay in the Dermastic Brightening Clay Mask. This mask has the brightening effects that will make your skin feel more alive. It helps in vitalizing & tone up. Can't wait for my skin to be treated soon so that I can have a brighter skin! Right side: Skin is brighter, and my red spots has gone lighter. I would definitely recommend you guys to grab at least 2 bottles for yourself to treat your problem skin! You don't need to apply too much to get the effect, and this big bottle sure will last you for at least a year!